This is a collection of zippers that I have been asked to stock by my friends who design bridal gowns or do alterations on evening wear. 1) Invisible zippers that pop: The zipper is too light weight for the fabric & movement of the body inside the dress, ie trying to sit down after dancing the night away. 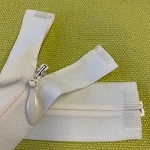 2) Separating (like a jacket) zipper for use in jackets, bodices, 2-piece gowns. 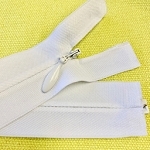 3) Long Separating Zippers to take the tail off the gown for the reception. 4) Colors other than white. 5) Sheer zippers for use in lace. Where possible, I stock both mesh tape and twill tape. It is the SIZE OF THE COIL that equates to the strength of the zipper, NOT the type or width of the tape. Hence, #6 is ALWAYS stronger than #2. A standard coil zipper is ALWAYS stronger than invisible. If you need a zipper, that I don't stock, give me a call or email. I'll see if it is possible.